Upcoming Events 11/07 Baseball Purple-White World Series 4:00 p.m.
11/07 Swimming & Diving vs. Iowa State (W) 6:30 p.m.
11/08 Baseball Purple-White World Series 11:00 a.m.
11/08 Football vs Kansas State 6:30 p.m.
11/09 Women's Basketball vs. Texas Wesleyan (Exh.) 2:00 p.m.
Spanish - AM 1270 Univision) 6:30 p.m.
Upcoming TV Games 11/08 Football vs Kansas State (Fox)	6:30 p.m.
11/13 Inside TCU Football with Gary Patterson (FSSW) 3:30 p.m.
Offer: Complimentary Fountain Drink or Cookie with purchase of a sandwich or salad entree. 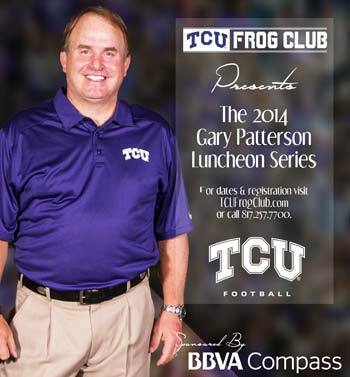 The TCU Frog Club and BBVA Compass are pleased to present another season of the Gary Patterson Luncheon Series. 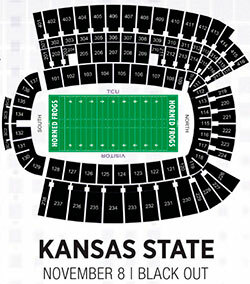 We look forward to an exciting new year of Head Football Coach Gary Patterson, and guest speakers from the TCU Football staff and the Big 12, bringing Frog Club members their unique insight into each upcoming home football game! Parking available in the adjoining visitor lot and lots 3 & 4 (shuttle service available) located on West Cantey Street. TCU hosts Kansas State on Saturday at 6:30 p.m. in a meeting of top-10 teams. The game will be televised on FOX. TCU head football coach Gary Patterson held his weekly news conference on Tuesday in the Four Sevens Team Room. Included below are excerpts from Patterson's meeting with the media. TCU's Jaden Oberkrom has been announced as a semifinalist for the Lou Groza Award, presented to the nation's top place-kicker. Oberkrom is the nation's top kick scorer at 11.3 points per game, a mark that ranks sixth overall among all players. A junior from Arlington, Texas, Oberkrom is 14-of-18 on field goals, including a 37-yard kick as time expired to give TCU a 31-30 victory at West Virginia last Saturday. Ashley Smith had a career night and led the charge as the TCU volleyball team upset No. 24 Oklahoma 3-2 (13-25, 25-18, 25-27, 25-19, 25-11) on Wednesday night at the University Recreation Center with TCU extending its Big 12 winning streak to three matches. The Horned Frogs (15-10, 5-6 Big 12) defeated their first ranked opponent since Nov. 10, 2011 and their sixth under the tenure of head coach Prentice Lewis, while improving to 12-2 at home. Smith had a career-high 20 kills and only one error for a .413 hitting percentage and added 10 digs on the night for her team-leading eighth double-double of the season. Blaire Pickens came into the match and struck down a career-high 13 kills and was good for a career-high six blocks. Mattie Burleson and Sarita Mikals completed the balanced offensive attack against the Sooners (16-7, 7-3 Big 12), with Burleson putting up 12 kills and four blocks, while Mikals recorded her seventh double-double of the season with 11 kills and 12 digs. TCU will hit the road for the next three matches, beginning with a nonconference matchup with North Texas on Nov. 9. The Frogs will resume Big 12 play with matches at Baylor on Nov. 12 and at Iowa State on Nov. 15. TCU couldn't overcome a two-goal deficit and saw its season come to an end with a 2-1 loss to West Virginia in the quarterfinals of the Big 12 Soccer Championships. Vittoria Arnold made a season-high 10 saves in her final collegiate game. TCU weathered a furious attack from West Virginia in the first six minutes of the match. Arnold was called on to make three acrobatic saves to keep the match scoreless. TCU's season comes to an end with a final record of 8-8-3. Kyan Anderson scored a game-high 31 points Thursday night to lead TCU to a 69-61 exhibition victory over Tarleton State at Wilkenson-Greines. Anderson, who posted his second career 30-point game, was clutch down the stretch, scoring seven-straight after the Texans had pulled within two. In the end, the Fort Worth native went 8-of-11 from the field, including 13-for-13 from the charity stripe to lead all scorers. Sophomore Chris Washburn was the only other Frog in double-figures, scoring 11 points on 5-of-7 from the floor. The Horned Frogs will open their regular-season Friday, Nov. 14 against Prairie View A&M. Start time is set for 7:00 p.m. from Fort Worth. FrogVision introduces Sydney Coleman, the lone true Freshman on this year's TCU Women's Basketball team. Nolan Brown's fifth-inning grand slam helped the White team to a 9-5 victory over the Purple squad in the first game of the Purple-White World Series. Brown's two-out grand slam capped an eight-run fifth inning for the White squad. The White team held on for the win in eight innings. Alex Young earned the win in relief. He fanned two of the three batters he faced. Preston Morrison got the start for the White squad and allowed four runs on three hits in four innings of work. Tyler Alexander started for the Purple squad and gave up three runs on eight hits in 4 1/3 innings of work. Game two of the Purple-White World Series is set for Friday afternoon at 3:30 p.m. Purple will send Brian Howard to the mound to face White's Riley Ferrell. The TCU women's swimming & diving team hosts conference foe Iowa State on Friday, Nov. 7, at 6 p.m., at the University Rec Center Natatorium. The first 50 students with their student ID will receive a free TCU swimming & diving t-shirt. Admission is free for all fans. The TCU men's tennis team's run in the main draw of the singles and doubles bracket at the USTA/ITA Intercollegiate National Indoor Championships came to a close on Thursday at the Billie Jean King National Tennis Center in Flushing Meadows, N.Y.
Cameron Norrie, Trevor Johnson, Nick Chappell and Will Stein all battled hard in their matches, but came up just short and will now move into the consolation brackets at the indoor championships. Seniors Katelyn Gray and Kaitlin Perry were named Big 12 Riders of the Month Thursday in their respective disciplines. Gray earned Big 12 Rider of the Month honors in Reining after compiling a 3-0 record during the month of October, with all three victories coming away from home. Perry was named Equitation over Fences Rider of the Month after recording a 3-0 record in October, including a 1-0 mark against Big 12 foes. Fresh off an 11-7 victory over nationally ranked Oklahoma State, TCU equestrian moved up to No. 5 in the latest NCEA poll this week. Football's Paul Dawson and volleyball's Mattie Burleson have been names TCU's Muscle Milk Athletes of the Week for their performances last weekend. Dawson had a crucial interception, his third of the season, which led to TCU's third touchdown in their victory over West Virginia. Dawson, who leads the Frogs in tackles, recorded 12 against the Mountaineers, including a 12-yard sack. Burleson's seven kills against Kansas helped propel the Frogs to a win after trailing 0-2 in the match. The junior from Edmond, Okla. also had an outstanding performance against West Virginia last Wednesday where she the lead the Frogs with 12 blocks and recorded 11 kills. Football's Jaden Oberkrom and equestrian's Kaitlin Perry have been named the TCU Scholar-Athletes of the Month for October for their work on and off the field. Oberkrom helped TCU earn wins over Oklahoma State, Texas Tech and West Virginia during the past month. Oberkrom notched a TCU record against Tech with his 10 PATs made. He followed that performance with a 37-yard field goal in the last seconds of the West Virginia game, leading the Frogs to a come-from-behind victory. Perry went 3-0 during the month of October, including 1-0 in the Big 12 competition. She also earned Most Outstanding Performer honors against Baylor. Ocean State University (OSU) women's soccer team is hosting Bay State College this evening. Since it is Halloween, the coaches would like to provide each member of the visiting team with a small bag of candy. Yes. NCAA Staff Interpretation - 8/26/13 - Providing Goodwill Packages to Visiting Teams (I) - states that it is permissible to provide all teams participating in an institutionally sponsored competition with a goodwill package containing various mementos (e.g., coffee mugs, candy packets) of norminal value. Jessica Hazard - Compliance Coordinator-Eligibility Remember To Ask Before You Act! Please feel free to contact the Athletics Compliance Office at (817) 257-7525.